Virginia is one of highest earning states in the nation, with a gross domestic product of $452 billion. It has many counties that are in top 100 wealthiest counties in the country, and a ratio of 6.64% of millionaires per capita, making it the seventh state with the most millionaires. It has an extensive coastline up the Chesapeake Bay, and a bit on the Atlantic ocean. Jamestown was the first of 13 Colonies, the first English settlement. Eight of our presidents have been born here, so you’ll be sure to get a fantastic education here. On top of great economic and educational opportunities here, you’ll also have a good sense of safety due to the low crime rates at its 25 safest cities. Leesburg is the safest city in the state, and is also ranked as the 91st safest city in the nation. 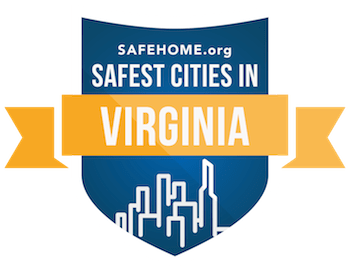 There are 8 more cities in Virginia that made it onto our 500 safest cities in the nation. Nearly all of the cities on our top 25 safest cities list, have experienced a decline in property crime rates, or at least did not go up in occurrences. Several of the cities have seen a decrease in violent crime rates as well. Back to Leesburg, what makes it the safest city in the state? With a population of 51,254, it has a safety score of 85.54. It has been going through a lot of growth over the past few decades, as it has many job opportunities, as well as being an hour from Washington D.C. for commuters. The median income is $105,260 for families. The ample job opportunities in the government and private sectors, and the great education system, attracts well educated and financially stable residents. Closer to D.C. is Fairfax City with a safety rating of 84.37, for those who don’t want to commute as far to a major city. Manassas is further inland, with a safety rating of 84.11, for those who want to be a bit more in the country and rolling hills of Virginia. If you’d like to be by the ocean, then Virginia Beach is for you, and a great safety score of 81.13. City life, beach life, or the country life can all be had in this great state.